I had Silly Putty too through the years and loved copying the newsprint onto it too. But when you think about it, there really wasn't much else to do with it, was there? 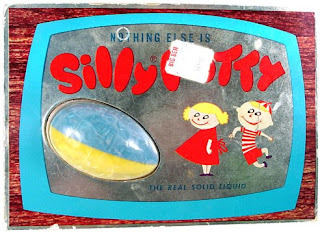 Silly putty was even out when I was youngster! Loved it. Especially transferring colored images from comics to flattened pieces of silly putty. I used to build clothes for my smaller dolls out of silly putty. I don't really know why. It would get stuck in their joints and look gross. I'm wondering how close we are in age - I loved Judy Blume, and had a haircut very similar to your photo, in 4th grade.